Days are dark at almost 71 North. This picture from my mobile phone was taken last Sunday close to local noon. 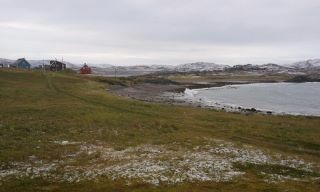 Usually, December days are a bit lighter because of the snow reflecting the modest light from the sky, but this autumn and winter has been 3-4 degrees Celsius warmer than normal, so there is very little snow at the coastal areas. It was -1C that day. The picture faces south-southeast and is taken from the QDFA phaser/power box after I had installed a full-charged 18 Ah battery to the QDFA phaser. It will last for another 3 weeks before needing replacement. The mast to the right is the center of southernmost of the four QDFA deltas (or rather "houses" as they have been redesigned to). If you want to tune from zero (almost) to eternity, this is it. With a 9 kHz to 3500 MHz tuning range, two independent 4 MHz channels (also available for recording and later playback), excellent specifications and a multitude of tools for signal analysis, this appears to be the heftiest SDR available today. Alas, the price tag will require dedication or easy cash flow, and I am rather sure that I don't want to spend USD 4000 for a receiver today. So don't expect to see a G39 review on this blog. But Nils Schiffhauer got his priorities right, and submitted this video to the Winradio G3 reflector. Readers who know the G31 and G33 interface will note that the playback bar is different, resembling that of SpectraVue. For the average MW DX-er though, such as I, the G39 doesn't do much that the G31 and G33 don't, so it's probably overkill. Would be übercool to have one though. The first official software update since the introduction of the G33DDC has just been made available, with numerous small and a few very important changes. In version 1.61, if one tuned around inside the DDC spectrum while recording (and who wants to be stuck on one frequency while recording), the spectrum itself would actually move, making it impossible to play back the recording properly. The demodulated frequency would change with the changing DDC spectrum. I first thought this was a bug but in fact it isn't; it's a feature but with an unwanted side effect. The feature is that one can move the DDC spectrum at will within the 0-30 (or 50) MHz range while recording. The update makes it impossible to move the DDC spectrum while recording with the .ddc extension. So you are free to tune around inside the spectrum. For recordings with the .rxw extension, moving the DDC spectrum during recording requires the "Insert FDT" function to be disabled. So, if you record a DDC file, or an RXW file with FDT enabled, the spectrum will not move. Another important change is how the playback bar works. Previously, it was cumbersome to move within playback of a DDC spectrum recording. The playback bar has been redesigned so that the handle or thumb is easier to "grab" with the mouse pointer, and the left and right arrows have been assigned to five-second steps. In addition, if you click on the bar, the recording will move back or forth with what I believe is 1/30 of the length of the file (or files, if they are linked into one larger recording). Of course if you move the handle you can maneuver at will within the recording. Another thing that has been up lately (though unrelated to the software update) is that DDC files recorded in the .ddc format in one time zone (or during daylight savings time) will not show the correct time when played back in a different time zone (or during "normal" time). This is because the date and time information is not embedded in the file, but merely part of the file name. This not a problem if recordings are made in the .rxw format, which is Winradio's proprietary format. However, .ddc is the default file extension, so you have to actively select rxw when you start a recording. Press "Browse" and select "RXW" from the file types dropdown. Or simply replace ".ddc" in the file path with ".rxw". The software will remember the file format for subsequent recordings, even if you shut down the program. For scheduled recordings it's a bit more cumbersome as you need to define the file format for each task you add. After having played around with the RF Space NetSDR a few weeks, I thought it was time to share my impressions. A PDF-file is available in the Links section to the right, or you can view it as an html-page here. Although propagation hasn't been outstanding, it has at least opened up for trans-polar signals the past week or so. But it's a rather weird coincidence that most times a DX test is announced, the conditions will go rock bottom. As they are today, during WGBW-1590's test going until 0700 UTC. Not even a faint trace of a signal. Even the near-24/7 companion KBRW-680 is gone. The reason is that the proton flux began to rise yesterday, almost to the level of a proton event. Increased proton flux levels will always kill propagation in polar regions. I hope they will set up a new test sometime, though. I had four SDRs with me to this DX-pedition: The Winradio G31DDC and G33DDC, the RF Space NetSDR and the Perseus. The Perseus has been with me for a few years but the G33 and the NetSDR were new this year. Actually, the G31 was never put to use. I've been just as busy testing and discussing software as DX-ing this time, actually a rewarding experience since I've had some fruitful discussions with Simon at SDR-Radio.com and Ian at Radixon (Winradio). Most of the time, if not all, the Perseus has been connected to the 50-degrees beverage, the G33 to the 340 and the NetSDR to the 310. 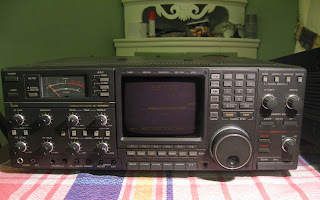 We also had the QDFA up, and another receiver (G31) available. But they were never put into use. The QDFA wasn't working properly, and the reason wasn't discovered until Saturday afternoon when the rest of the crew had left. A rodent had short-circuited the feedline.The cut was so small I didn't discover it the first time I checked the feedlines. And although conditions weren't outstanding, we never found time to investigate deeper. Until Saturday afternoon. The QDFA feedline is now fixed, and will be available for remote DX for the four of us when conditions improve. Even today the effects were stunning compared to the 340 beverage (the QDFA is 350 but a wider front lobe) as semi-local Murmansk 657 was 27 dB weaker on the QDFA, while KBRW on 680 was a dB stronger. Similar effects on 1035 where China and Estonia were fighting for glory on the 50 degree, but the QDFA nulled Estonia almost into noise level. Nighttime conditions were poor throughout the week so we probably wouldn't have heard a lot more anyway, but it's a bit embarrasing to know that we could have lost a lot of good DX because we failed to spot the faulty feedline. The G33 has been a real workhorse. It's been 100 % stable, and by and large is an excellent receiver. The NetSDR was tested with both Spectravue and SDR-Radio software, the latter with beta versions. Most of the time operation has been smooth and trouble-free although I had trouble with scheduled recordings a while until a fix was made. A write-up on the NetSDR will be released soon. Unfortunately, my impression is that the Loran C noise has been worse than ever this fall. Some frequencies are almost impossible to listen to. I hear rumours that the Loran C network will be closed in 2015. We'll see. 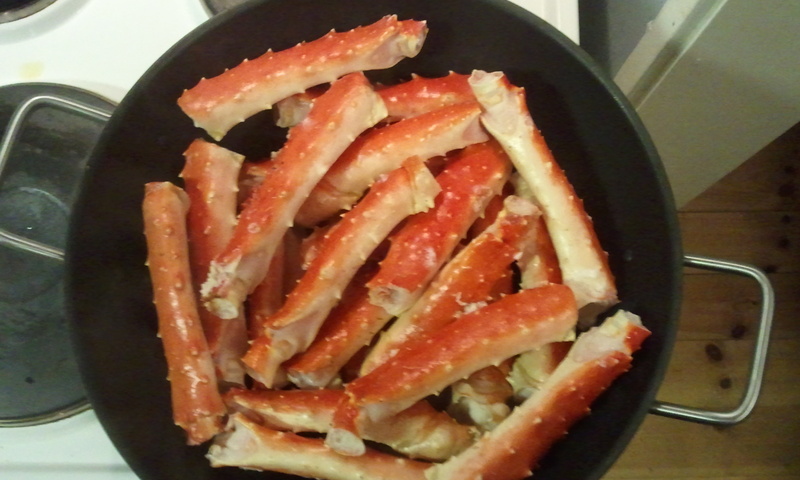 Finally a picture of the signature dish here in KONGsfjord, namely the King Crab, in Norwegian KONGekrabbe. The raw, frozen crab was supplied by Berle Fisk AS and Svein Olaf, and was immaculate. The best restaurants in Oslo aren't even close in matching this quality. The solution is surprisingly simple, although it involves a bit manual labour on the keyboard. The key is the G33 software, which can play back G31 recordings. The G31 has a frequency stamp (Insert freq) which keeps track of the center frequency. The G33 on the other hand has a date, time and frequency stamp (Insert FDT). The frequency bit is identical on the two. What separates them is the date and time bit. So I thought: What if I inserted the date and time info manually to the G31 file, and played it back with G33 software? Of course: If you have a lot of files, it will take some time to change the file names. And linked files may take longer than separate files, because linked G31 files use the -$001.ddc syntax while G33 files use -^001.ddc syntax. But the linked files will have the same date and time stamp as the first file. If you have made a habit of writing down when a file starts, the time should be fairly accurate. And if you haven't made that habit, now is the time. A word of caution: Always, always, always back up the files you want to change. G33DDC software is available here. Would you believe that Radio Kiribati 1440 could be the strongest skywave station in Arctic Norway? Well today it is. A nice -90 dBm on the 50 degree beverage is only matched by KICY Nome AK 850. Even some of the Russian groundwave signals are weaker. Strange conditions. Very strange indeed. As usual, I cannot resist the temptation to write about the receivers I have. Some initial impressions have been posted earlier in this blog. You will find a more detailed report in the Links section, or here. Comments are appreciated. Wow. What an uneventful night, followed by an uneventful morning. Now we're in the middle of an uneventful day. Only the usual dominants are heard, and not at very good signal levels either. Which is a bit strange, since there is no indication that the solar weather has turned worse, on the contrary. While we're waiting for things to improve, we check recordings from prior days and some nice stuff is found such as KPAY-1290 and KQEQ-1210. My own October log is still here. We are looking forward though, to Arnstein's special dish, Bue's Uruguayan tender loin beef tonight. An uneventful night, but a bit better in the daylight hours. 910 produced KCJB first, later on KWDZ. Graveyard channels mostly dominated by Idaho, Oregon and Washington stations. KBLA Santa Monica CA had a wonderful signal on 1580 a while. We had hoped for similar Asia/Pacific conditions as yesterday, when Kiribati-1440 had a great signal prior to s/off 0930 UTC, but the band has been very, very quiet. Only now, around 10:30 do we hear the first Japanese stations. Luckily, the sun is still relatively quiet, and we can only hope for it to stay that way. I have had the chance to play around with the new Winradio G33DDC with the latest software revision a few days, a "joint venture" between me and Radixon. We have indeed made some progress, and I hope it will continue. Things are going as planned, with reasonably good conditions. Even New Zealand was heard today, and so was Kiribati 1440 - which is predicted to be a common guest in the morning before it closes at 0930 UTC. Cool and windy on Friday and partly Saturday; rather warm for the year today with around 10 Celsius, but increasing wind and rain is heading our way now. Below a couple of pictures of last night's ordeal; a King Crab Carbonara main course and some selected cheeses with port for dessert. OK conditions towards the western part of the US today, and some very low powered Japanese stations also showed up. Mostly, one antenna will be connected to one radio; the 310 antenna is connected to the G33 etc. Actually not new - Kiribati's 846 kHz outlet has been heard here on a number of occasions. However, in 2008 the transmitter broke down after havning had serveral technical problems. On March 28 2011 Radio Kiribati started broadcasting on 1440 kHz, replacing 846. To my surprise, Radio Kiribati was heard with a nice signal from 0929 UTC today, until sign-off at 0950, although with occasional interference from Japan. Nice ID at 0936. The MW band was exceptionally quiet at the time with very few stations audible. Another year, another KONG DX-pedition. This year, it starts today and ends on Saturday, October 21. TJ Bråtveit and Arnstein Bue are scheduled to arrive at 1100 UTC while OJ Sagdahl takes a later plane and arrives at 2100. Conditions are ok, not exceptional but not discouraging either. A number of Perseus, Winradio G31s and G33, an RF Space NetSDR and a QS1R will help us get through the coming week. And if they can't help, we are well supplied with 10 kgs of King Crab, reindeer tender loins, fresh salmon loins, ox tender loin from Uruguay and carefully selected red and white wine, champagne and various other beverages. Speaking of beverages, the antenna farm is the usual: a QDFA and three beverages directed at 310, 340 and 50 degrees. Just below freezing today so the roads are icy and a bit slippery, but we're expecting close to 10 Celsius on Sunday. I'd say that's fairly good. The G31 doesn't have a built-in preamp, like many conventional receivers have, so a direct comparison may not be fair unless an external 10 dB Norton push-pull preamp is placed in front of it. If so, the G31 will play games with anyone. The sun hasn't been kind to us lately. The contrast between now and a year ago is startling. But there's not much we can do about it except search for the few openings there are. Like this morning at 0400 when east coast stations were well audible. A check of the overnight scheduled G33DDC recordings was not encouraging, but at 0400 things opened up a bit and I noted WFLR Dundee NY 1570 which is a rare guest, along with WBAE Portland ME 1490 (actually a new station for me at this location) and a few others. Some of the Ontario stations like 1580, 1380 and especially CJMR-1320 had excellent signals, but then they are not the ones we want to hear. October 9 was the first day of the season with a thin white layer on the ground. It's expected to stay cool but above freezing the week to come. OK. About time to explore the functionality I missed in the G31. First a few words on on-the-fly recordings: This function works well but one should take care in activating the "Insert FDT" button as well as the "Split" button - the former to ensure you have frequency, date and time associated with the file, and the latter to avoid monstrous DDC files. (For the record: No, a 2 GB DDC file is not monstrous). You can activate a buffer to make the recording start up to 3 seconds earlier. While the idea is very good, the limited buffer size makes it less useable than if you could select up to say 10 seconds. The jpg should be self-explanatory. What I'd like to add is that "Start time" is always the PC's local time, not UTC. Take care in selecting the correct DDC bandwidth (default is 24 kHz), and find a suitable argument for the Stop recording function. A scheduled recording is played back as shown below. If recording has been set up to split, the Scheduler will automatically start a new file linked to the previous one, and on playback will do so seamlessly. Note that although the timer and the file name refers to the PC's local time, the date and time line to the left of the playback bar will display UTC, if UTC has been selected to be the primary time display (Options -> Time). Sadly, the playback bar is still difficult to manouver. Inspiration for improvement could come from as different sources as Perseus, SpectraVue, SDR-Radio and Winrad. They are all much better. G33DDC files will be huge. This is because unlike just about every other SDR on the market, the G33 makes 32-bit recordings up to 3 MHz bandwidth. The widest spectra (3.2 and 4 MHz) are recorded in 16 bit due to limited USB 2.0 transfer rate. Thus, 2 minutes, 40 seconds at 1.25 MHz will take up 2.2 GB. In comparison, the Perseus is 24-bit for all bandwidths except 1600 kHz (16-bit), while the netSDR is 24-bit up to 1 MHz and 16-bit on 2 MHz. A 32-bit file contains more information than a 16- or 24-bit file. The question is of course if the added information can be used to hear more stations, like a considerably higher dynamic range, sharper selectivity etc. It would be nice if that was the case. Until someone comes up with proof I find it hard to believe that a G33 file recorded in 32 bits would let me hear more DX stations than a Perseus file recorded in 24 bits. After having tested the two Excalibur SDRs, the G31 and the G33 "Pro", it's time to draw some preliminary conclusions. Those who have followed my blog, and postings to the Winradio G3 reflector, will know that I have found the G31DDC to be an excellent receiver, but with a serious drawback: The missing ability to date- and time stamp DDC recordings. In fact, the files do not contain any date and time information. This is of course a software issue and not a hardware one. 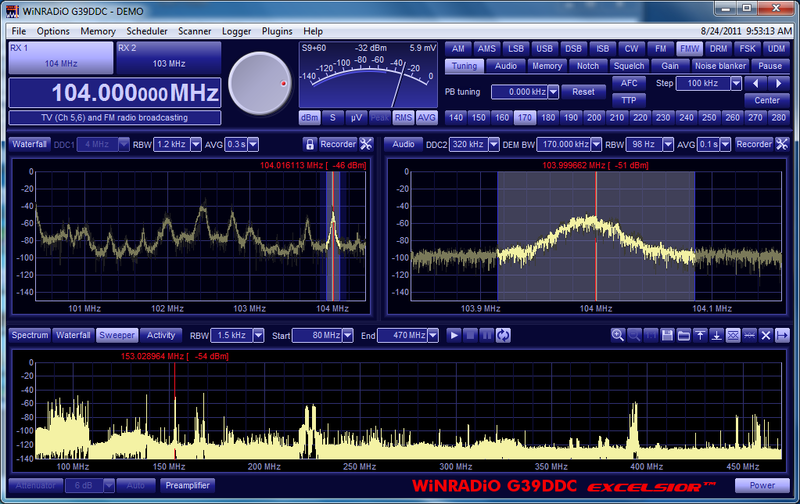 Winradio decided to wait a year, until they released the G33DDC, to implement this crucial function. So, if you want to use a function found in all other important SDRs (including the low-cost SDR-IQ), you need to "upgrade" to a "pro" version of the Excalibur. There was a heated debate on the topic on the Winradio G3 reflector a while ago, which ended with us "whiners" basically being told (in a more diplomatic language) to shut up or get lost. Mind you, this was not posted by a Winradio representative. Anyway, I couldn't resist the temptation to buy the G33 (thus proving that Winradio's business philosophy works, unfortunately). A record-breaking shipping time of only seven days from Grove Enterprises allowed me to test the SDR this weekend. As you can see from the display screendump above, the G31 and G33 GUI is basically the same. The only difference is the added functionality in the G33 hardware and software. The G33 software can play back G31 DDC recordings. More surprisingly, the G31 software can play back G33 recordings, although without date and time, and limited to the 2 MHz DDC bandwidth of the G31 software But why would you use G31 software for G33 playback. The G33DDC is as sensitive as the G31, a uniform -106 dBm or 1 uV was measured which is very good for SDRs. The G33 even has a 10 dB preamp, which should allow for even better sensitivity. At first I found no audible or measureable effect and thought it could be a software bug in version 1.61. However after testing with the G33's built-in measuring tools, I found the preamp to increase sensitivity to around -110 dBm, making it with a good margin the most sensitive amateur-grade SDR in the market. For those (few?) who need it. 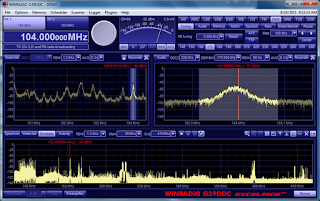 So then: How do the two Winradio SDRs compare? To find out (and to save myself from writing and my readers from reading a long and boring blogpost), I set up a matrix with functions I have found interesting for the DX-er in general and the MW DX-er in particular. The grading is subjective. I may have overlooked something. Please comment if you find other important differences between the G31 and the G33. Value for money? Well, sort of. For me, the G31 was a disappointment in two important parameters, but others have different views. The G33DDC is USD 1,650 from Grove Enterprises. A UK quote is GBP 1,333 ex. VAT (comparably a lot more). A Perseus bought in the UK costs only GBP 583 ex. VAT (exactly the same as the G31DDC), leading me to the conclusion that in Europe, the Perseus is much better value for money. In the US the situation is somewhat different with the Perseus selling for USD 1,000. The RF Space NetSDR is USD 1,450, but the netSDR is hardware expandable and basically a different receiver altogether (and under a continous software development). In conclusion, the G33DDC is what the G31DDC should have been. But revenue is everything. Actually I had decided not to buy it. Then I discussed the matter with my good friend Takashi Kuroda who had bought one to replace his G31, and I decided to place an order at Grove Enterprises. The delivery time was a stunning seven (!) days. I've just unpacked it and connected it to an aging dell laptop running a 2 GHz dual-core Intel T6400 CPU. Incidentally, the stated MSR is "2 GHz Dual Core"... I was pleasantly surprised to see that even at a 4 MHz sampling (and recording) rate, CPU load would not exceed 30 % (filter length set at 5000). No antenna connected yet. I will go to Kongsfjord this afternoon. More as it happens. The results I reported a few days ago regarding the QDFA's good F/B ratio vs. the 310-degree beverage was for groundwave reception. Now DX-ers are more interested in skywaves than groundwaves, so tonight I set up a test to find out. Although there were a couple of unexpected results (Pori, Finland 963 stronger on the QDFA than the beverage for instance), the general picture is that the QDFA has 5 to 10 dB weaker signals from the back than the beverage, while it has 9-12 dB stronger signals than the 310 beverage from the front. Admittedly though, only NRK Svalbard 1485 and the NDB "BV" 399 were on the "right end" so the results should be treated with some caution. Add to this picture that the netSDR which was running the QDFA is 2-3 dB less sensitive than the Perseus, which ran the 310 beverage. Switching antennas confirmed this. The QDFA had an extra 10 dB of gain in front of it, a Kiwa preamplifier. 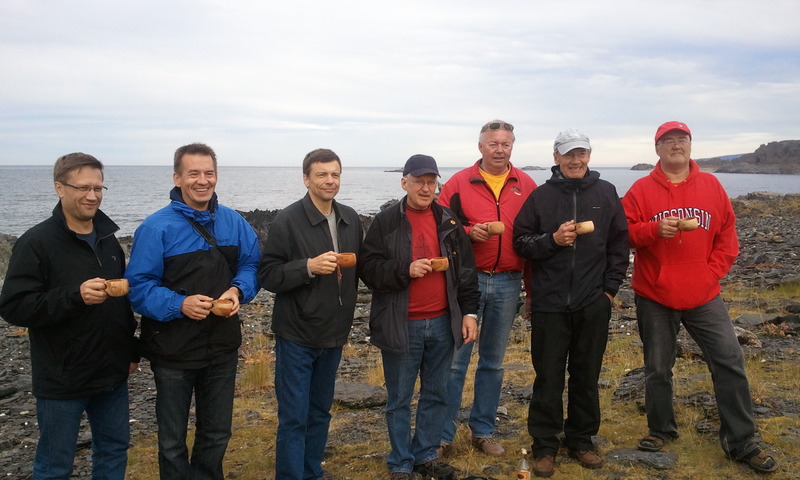 I've been fortunate enough to have a large variety of receivers coming (and going) at my Kongsfjord QTH. Some are/were mine, some were here on a temporary basis. 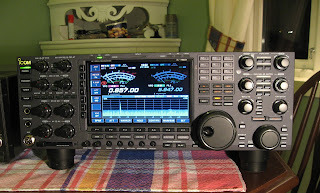 Two of the latter category are the Icom IC-7800 transceiver, and the Icom R-9000 receiver. Both very high end, both in terms of performance and price. Lots of thanks go to Olav Skår, LA9VFA, who let me play with these superb radios. Of course I never resist the temptation to measure the sensitivity of a receiver. The IC-7800 is stated (as all Icom receivers and transceivers are) to have reduced sensitivity below 1.8 MHz. As far as I know, all their radios produced in recent years are not desenstized on MW. 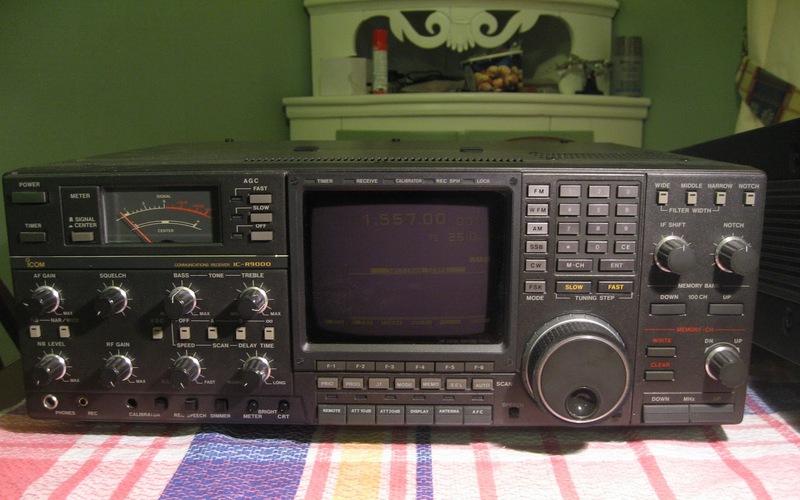 This was confirmed for the IC-7800 as I measured a uniform -106 dBm to -108 dBm (around 1 uV) throughout most of its frequency range (600 to 20,000 kHz). The R-9000 however is an older model, and it was indeed rather deaf on MW with figures around -92 dBm or 4 uV. On SW, it was marginally less sensitive than the IC-7800. I finally got round to measure my new netSDR from RF Space too. A uniform -101 dBm or 2 uV was measured from 600 to 20,000 kHz. I had hoped to see it a few dB better, but it equals the SDR-IQ, a bit better than the QS1R and marginally weaker than the Perseus and the Winradio Excalibur (G31DDC). An external preamp would help. Parameters: Measured with a signal generator while running AM mode with 6 kHz bandwidth, AGC off, and using 30 % modulation of a 400 Hz tone. Today I did an A-B test on my NetSDR a bit prior to 1100 UTC, local noon. The difference between the 310 beverage and the QDFA is interesting. The Noise Floor of the QDFA was 3-4 dB lower than the beverage, when they were both powered by a 10 dB preamplifier/splitter. Interfering stations on the back of the QDFA, such as the Murmansk stations were attenuated by up to 40 dB (657 kHz). 1134 was reduced from -77 dBm to -115 dBm. On 1521 the attenuation was 13 dB. On daytime we don't have any stations in the "desired direction" to compare, except the Berlevåg NDB "BV" on 399. It was 15 dB weaker on the QDFA than on the beverage. The illustrations below may speak for themselves. The Ingøy AM transmitter on 153 had equal strength on the QDFA and the beverage. It is located due west of here. Front to back (F/B) attenuation increases with decreasing frequency. Groundwave attenuation is stable and very effective. Judging from last night's comparison, skywave F/B attenuation is less effective, but still significant. Nothing of this is new knowledge. It is however extremely satisfactory to see that the QDFA works well. Actually, our preliminary conclusion is that the QDFA is more effective with regard to F/B than last year's QDFA was. Maybe there are subtle changes in the setup we were not aware of that did this. One less subtle change we should have done but so far haven't, is to replace the lamp cord feed line with Twinax. Judging from other lamp cord to Twinax replacements, this will only make the QDFA better. 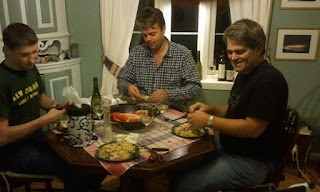 On Sunday, the 10 participants of ADXS2 had brunch with rye bread, foccacia and king crab leftovers. We soon entered an engaged discussion about the virtues of Bentonite! The Finnish delegation will leave after noon to catch the Finnair flight from Ivalo to Helsinki. 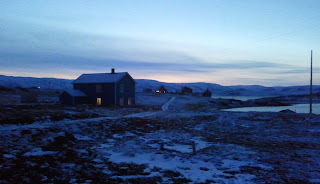 I will leave for Vadsø a few hours later, while OJ Sagdahl and TJ Bråtveit will hold the fort until their departure on Monday. The Saturday was used for erecting and preparing the QDFA antenna. The creator of the QDFA phaser, Dallas Lankford, has made a few modifications mainly to keep its transistors safe during weather-induced static. For a pre-sesason test, we were delighted that NRK Svalbard had a very good signal on 1485. To show the Finns the virtue of the QDFA, we arranged a comparison between the QDFA and the 310-degree beverage (pointing towards Svalbard). Interestingly but not very surprisingly, the Svalbard station was the strongest in the band on the QDFA, and European stations were attenuated by 15 dB or more compared to the 310 beverage, while Svalbard was only a couple of dB weaker on the QDFA than on the 310. So the net effect of the QDFA vs. the 310 beverage is 10-15 dB front to back attenuation. With four well-working antennas up, we are now ready to log new stations. Been a bit too busy to inform about this event, however here is a brief update. 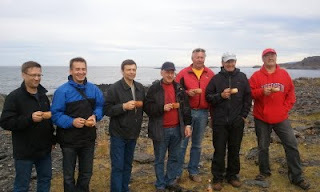 From September 9 to 11 seven Finnish and three Norwegian DX-ers have met at Kongsfjord, Arctic Norway. The ADXS is a social much more than a DX-ing event, so the focus is on radio equipment, good food, good conversations, beverages (the long copper variant), beverages (the wet variant) and outdoor activities in exceptionally mild and calm weather. Below a photo of our Finnish guests. More as it happens. From left: Antti Altonen, Mika Mäkeläinen, Hannu Tikkanen, Håkan Sundman, Jan-Erik Österholm, Hannu Niilekselä, Roland Sandberg. A relatively new SDR on the market is the NetSDR which, contrary to most other SDRs, communicate with the PC over a 100 base-T port instead of USB. Another interesting aspect is that while you need remote control software like LogMeIn to control other SDRs over the internet, the netSDR actually transports its full 1.6 MHz waterfall and demodulated audio via a 10 kbps link. It uses straight TCO/IP and ethernet for all communications. In many ways it can be seen as a downscaled version of the SDR-IP. The NetSDR arrived today, just in time for the Arctic DX Summit. Initial impressions using Spectravue and SDR-RADIO software are very positive. Its footprint is quite a bit bigger (almost double size) than the Perseus and Winradio Excalibur. It has room however for some very interesting hardware to be retrofitted. More on this after I have explored the radio a bit further, including sensitivity measurements. I rarely hear any Trans-Atlantic DX here in August. My northerly location is of course to blame. Last night though, the ususal eastern North America stations were heard with ok signals, such as 1200-Ottawa, 1500-Detroit, 1510-Boston, 1520-Buffalo, 1540-Toronto and 1600-Boston together with quite a few others (including rather surprisingly Pulse 2 from Huddersfield on 1530). The first signal from Down Under was heard Friday evening with presumed 1620-Sydney with Arabic music. Tonight's DX was somewhat noisy as there were frequent static crashes from thunderstorms somewhere. 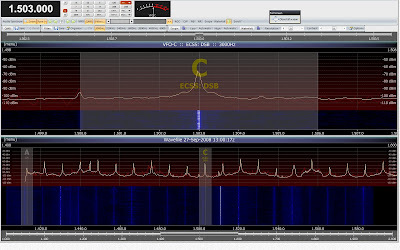 This gave me the opportunity to compare how the AGCs of the Excalibur software and SDR-Radio handled the noise. Generally there was a noticeable difference in favour of SDR-Radio. Nowadays with SDR software, AGC settings can be adjusted ad infinitum, but at least when it comes to out-of-the-box settings, SDR-Radio was the winner. The 340-degrees beverage (Western North America) was put up today. Unlike the other beverages it is lamp cord fed, not Twinax, and while the noise floor is at the same ultra-low level as the 50 and 310 degrees beverages, there are a few local noise peaks though not above -115 dBm. The jury is still out on the question should we replace the lamp cord with twinax. Actually, I have never experienced a noise level as low as today. China Radio International 1323 is 90 % readable at a signal level of 0.37 uV in AM mode, and 100 % readable at 0.6 uV. It doesn't get much better than this. Beverage 500 meters at 50 degrees, Twinax feed line. The 50-degrees Pacific beverage was set up last weekend, and erected to an average of 1.2 meters today. I also set up the 310 east North America beverage, but decided to keep the lamp cord feedline for now since the thought of rolling out 175 meters of thick and heavy Twinax was discouraging. When I connected the 310 there was practically no signal at all. The observant reader will have guessed that the feed line was at fault. I didn't at first, so I spent a few hours in total confusion. This year rodents are exceptionally plentiful, and it appears that the seasick-green lamp cord was mistaken for food by the voles who thrive around the house. So I decided to roll out the Twinax anyway. The endless hours at the gym finally paid off. And the 310 is now in excellent shape, except I have to elevate it from the ground. I think this calls for a Heineken on the balcony. Still a bit early in the season for any real DX. Want To Join Google+ ? Not quite radio related, but anyway: Google+ is an up and coming internet society with excellent integration with Google's product suite, combining the best from Facebook and LinkedIn. I have a few invitations to spare. If you want to join Google+, follow this link. 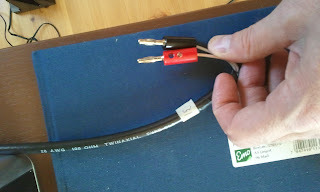 Observant readers will know that last year, we replaced our old coax feed lines (mostly RG-213 and RG-58) with cheap "Lamp Cord". Using balanced feed lines instead of unbalanced proved to be an immediate success in terms of noise reduction and flexibility. The cost was the need to put a 100:50 ohm transformer into the feed line before entering the 50 ohm receiver antenna input. Though if you didn't, you wouldn't lose more than a few dB. This summer, we purchased two 1000-ft rolls of "real" balanced feed lines, namely Twinax. It is not lightweight and flexible like the lamp cord - actually it's only a bit thinner than RG-213, but well screened and protected from precipitation, salinity, temperature changes and rodents. A brief test run last evening with the 50-degree, 500-meter beverage proved that Twinax is indeed the best solution. Some unidentified local noise sources were greatly reduced, otherwise the noise picture in general was the same. I also noted that signals coming perpendicular to the 50-degree beverage were reduced substantially. Indicating that the lamp cord compromised the beverage's side nulls. There was a slight improvement in signal levels alongside the beverage lobes as well, but this could be attributed to the Twinax test being done five minutes later than the lamp cord test (with a declining sun). Summary: The lamp cord is an excellent feed line for beverages (and other antennas as well). The Twinax is a superior feed line. Twinax feed line. Murmansk stations on 657, 1134 and 1521 are attenuated compared to the lamp cord. Higher signal levels elsewhere. This morning I replaced the 1.5 meter whip with the 3 meter whip. On SW, the difference was significant, with my semi-local Radio Rossii 5930 increasing 10-15 dB in gain. On MW however, there was only minor gain improvements as Rossii-657 increased its strength by only 2 dB. This concludes the test of the Clifton Laboratories Z1501 Active Antenna. I will most likely dismantle it from my Kongsfjord QTH and erect in in a tree outside my apartment in Vadsø. It will be interesting to see how much it will be affected by the usual noise a residential area will produce. The next step was to find a better location for the antenna. I erected it on a pole around 30 meters away from the house, and prepared the necessary RG-58 coax. Still with the 1.5 meter whip, I mounted the enclosure at around 2 meters, so the total height of the antenna is 3.5 meters. Mounting it higher will increase its gain. Both the noise level and signal levels improved considerably. As can be seen below, the antenna appears to have equal sensitivity all the way up to 30 MHz. I didn't compare with the Mini-Whip this time. At the time of writing, 90 minutes after sunset, it seems to work well on MW with a noise floor around -120 dBm. Weather permitting, I will erect my 310-degree beverage tomorrow. It will be interesting to compare noise floors and signal levels. I will also replace the 1.5 meter whip with the 3 meter whip to see how much gain increases. Already at this stage though, the Z1501 has proved to be an excellent all-round antenna, both with regards to coverage (since it is omni-directional) and frequency range. I didn't have enough coax at hand, so for the first test run, the Z1501 was put up with the 1.5 m whip alongside the house wall. Not a favourable position with regards to RFI, but enough to see how (and if) it worked, and to make a brief A-B test with the Mini-Whip. It has gain all right. I feared that the semi-local Loran C transmitter (250 kW on 100 kHz 14 km away) would make trouble when I connected the Z1501 to my Winradio Excalibur SDR. The Excalibur has no band pass filters or preselectors, so in principle it is wide open. I was right. I got ADC clipping and needed to attenuate 12 dB to get rid of it. I assume though, that conventional receivers with band pass filters or tracking preselectors will not be affected. Anyway I am used to Loran C trouble, so I have a suite of 100 kHz notch filters, one of which was inserted between the DC Coupler and the Excalibur. Loran C gone. To compare with the Mini-Whip, I mounted the latter at the same height as the Z1501 enclosure and ran a few tests. The difference in this daytime test (almost no stations audible) is significant. The 1449 Radio Rossii signal is 15 dB higher on the Z1501. But keep in mind that the price tag is at least "15 dB" higher too. It's a bit like comparing a Ferrari to a Fiat 500. 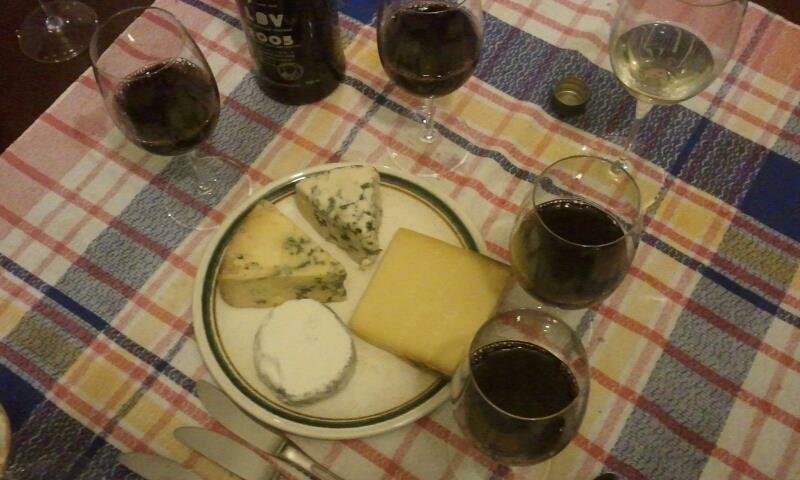 Conventional wisdom says that MW DX-ers use beverages whenever they can. And if they can't, they use loops of various sizes and properties. So what about whips? Noooo, serious MW DX-ers don't use whips. Whips are for FM or VHF. Only if nothing else works or is possible to erect (including a five cm ferrite bar), will a serious MW DX-er even remotely think about mounting a whip. Time to think again. Whips with good performance have been around a while. Many NDB DX-ers have successfully used Roelof Bakker's "Mini-Whip", an excellent proof that size doesn't always matter. I've had the Mini-Whip myself a couple of years, and although it has never outperformed my beverages and QDFA, it is an excellent device. For quite some time I have wondered about purchasing another whip. This summer I finally decided to go for it - not that I really needed it (and I don't think it will outperform my beverages and QDFA), but I was curious if it could perform even better than Roelof's mini antenna. The Z1501 is sold with either a 1.5 m or a 3 m whip. I chose both, since it was only USD 16 extra. The Z1501 is an electric field responding “active” antenna, employing a high impedance field effect transistor input stage to efficiently couple electromagnetic field from a physically short antenna to a low impedance (50 ohms) load. The most effective frequency range is 20 kHz to 30 MHz. The size of the weatherproof enclosure is 114x63x25 mm mounted on a larger mounting flange. It has a female BNC connector for 50 ohm coax feedline. In-house is a DC coupler which delivers 9-24 VDC to the antenna. It can also be used with other active antennas - I have used the Mini-Whip with it with good results. Enclosure and mounting flange. BNC out to the left. The Z1501 is bought as a kit or assembled. Knowing how soldering limitations, I opted for the assembled version. So how does it perform? We will soon find out. I recently received this item from the USA. I plan to test this gadget during the coming weekend, so late Friday or Saturday you will know what it is (many will have guessed already) and who made it (probably not that many). Sorry about the poor photo quality. The Perseus SDR was the first "serious" European SDR manufacturer, and soon drew attention to people who wanted to develop their own applications to expand the Perseus software. For the serious MW and NDB DX-er, maybe the best of them all is Jürgen Bartels' Station List, now in version 2.1.1.1. Imagine you being on a DX-pedition (or your own home for that matter), and in the course of five days of intensive DX-ing and recording you are stuck with some 2 TB of data. Maybe you have recorded all the TOH and BOH over most of the five days, and some interesting DX in between. Well it was fun doing the DX session, but when on earth will you have time to get through the thousands of potential stations? Let's say there are 100 interesting frequencies, you conservatively record two minutes on the top, two minutes at around five past, and two-three minutes at the bottom of the hour. That's 700 minutes of listening, for checking one single hour! Admit it, you're never going to get through all this. Often, when we check RF recordings, we select one recording, and start listening at the top end, or the bottom end. Now....there was an interesting station on 1290, I must remember that one when I start the next recording. But I don't, do I, because I found an interesting station on 1150 instead and forgot all about that interesting station on 1290. Now, wouldn't it be better if you could stay on 1290 for as long as it took to find out what it was - just change into the next file with one mouse click while keeping the same frequency and at the exact same spot in the playback? To track 1290 throughout the night? Of course it would. And that's what Station List does. Actually, the function mentioned above may not even be the main purpose of Station List. Describing Station List is a bit difficult, because aside for monitoring recordings, it is a lot of things. It is a database which interacts with Perseus; you can use a database to tune the Perseus, or if you tune the Perseus, the database of choice follows it. And you can import databases, such as KOJE, FMLIST, MWLIST, LA MW-LIST, EIBI, TBL and Nagoya. It is a tool for scheduled RF recordings. It is a log program. It is a tuning program. It is a server program. It is a server monitoring program. It is indeed a lot of things. Actually it is so much, it's impossible for me to write a comprehensive review or description. But it makes checking your 2 TB of RF recordings a lot quicker and a lot more fun than the traditional way. The pictures below may hopefully serve as an illustration. I will test the Scheduler later on. Works on XP, Vista and Win7 systems. 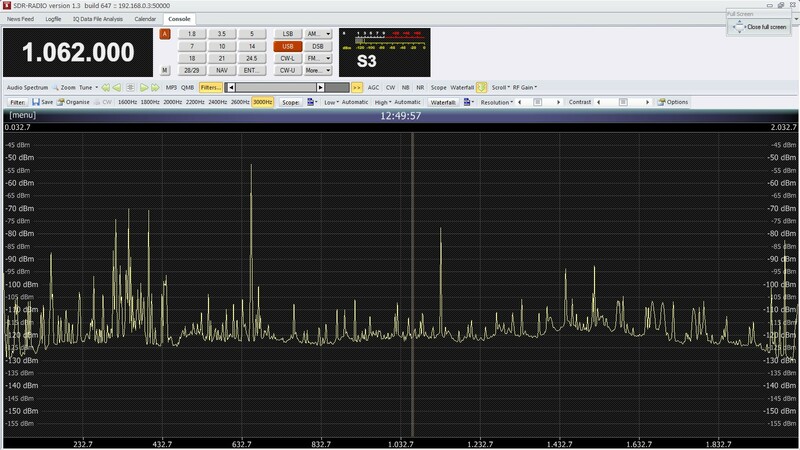 As owners of RF Space SDRs will know, their native software Spectravue, now in version 3.21, offers a powerful yet rather convoluted graphical user interface. For some time, SDR-RADIO.com has offered an alternative GUI, now in version 1.3. I decided to test SDR-RADIO with some old SDR-IQ files on my system. Later on, I plan to test the GUI "live", with an SDR-IQ. SDR-RADIO.com claims to be a Windows console for SDR receivers and transceivers. It is designed for the commercial, amateur radio and short wave listener communities to provide a powerful interface for all SDR users. Especially interesting for many DX-ers is that it provides an alternative to Spectravue for running RF Space SDRs. Not that Spectravue is a poor program. Its basic appearance is simplistic, with most if not all of its functions hidden in menus. SDR-RADIO.com moves most of these functions up front and adds quite a bit of user friendliness in the process. I will not go into detail about the software, since the possibilities are outlined at SDR-RADIO.com's home page. SDR-RADIO.com has a resizeable window, or can be run in Full Screen mode. The illustrations below show how they appear (note that I have selected the Zoom function at playback). The Full Screen mode appears clean and uncluttered with the basic controls available, and with the all-important date and running time available. However, for selecting a file or other input you need to use the resizeable window mode. With a lot more information available, space for the waterfall/scope is limited unless you have a very large display. Otherwise, SDR-RADIO.com offers a wealth of radio-related functions, such as the HFCC database, Solar data, a world map with the sun's position, and options enough to tailor-suite your GUI from here to eternity. One example: You can "design" your own bandwidths, and assign them to one or more modes. Playing back SDR-IQ files worked well. The console has three "VFO"s which can be configured independently, and an MP3 recorder using 32 kbps, 8 kHz mono. Now, this is one function where I wanted some options, such as being able to record wav. Apparently, this is not possible. And of course, you can record a chunk of the RF spectrum for later analysis - the holy grail of the MW DX-er. Very important for RF recording, the console has an Outlook-type Calendar with extensive recording scheduling available. However, you need to configure each recording session within one day independently; you can't plan a batch of recordings within 24 hours since the shortest recurrence period is 1 day. That calls for time consuming editing if you plan to record every full hour and every half hour for a night. Hourly recurrence should have been available as an option. While I haven't tested SDR-RADIO.com very extensively, it does indeed look like an interesting alternative to Spectravue. Remote control is said to be one major feature with SDR-RADIO.com that I haven't tested at all.